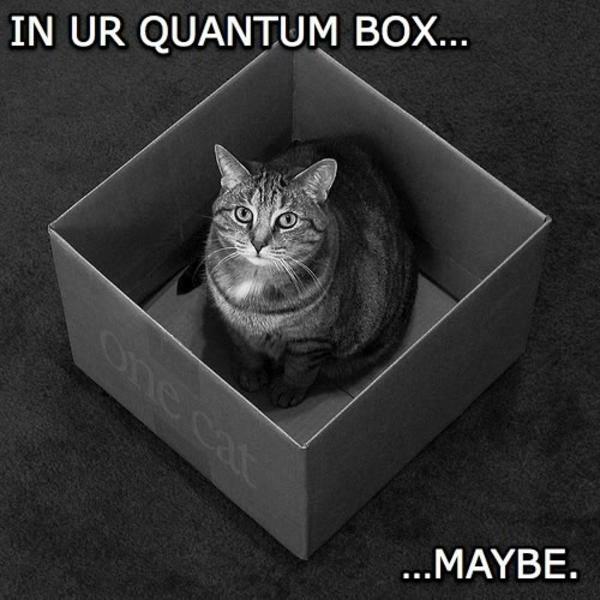 Schrödinger's cat hypothesis says that reality does not have a fixed nature until you look at it or try to understand it. Image Source: Know Your Meme. 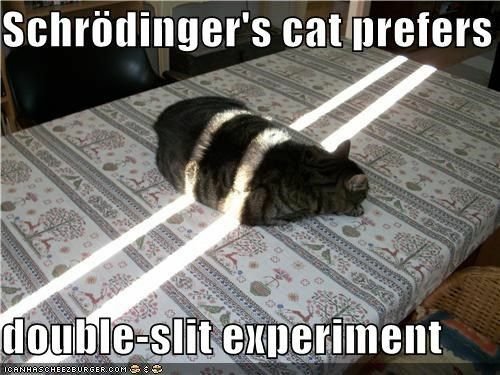 Caption for the above image: "The idea [of Schrödinger's cat] was conceived in 1935 by Schrödinger during a correspondence with Albert Einstein regarding the Copenhagen interpretation of quantum mechanics, which posits that two quantum entangled particles are in an indefinite state until measured, in other words, we can only ascertain the probabilities of measuring entities which are n[either] particles [n]or waves by classic definitions. To illustrate his issue with this notion, he devised a thought experiment in which a cat is placed in a steel container along with a Geiger counter, a tiny amount of a radioactive substance and a flask of hydrocyanic acid that would shatter if one atom of the radioactive substance decays. Based on the Copenhagen interpretation, the cat inside the box would be both dead and alive until someone lifted the lid of the box." Double slit experiment explained, showing how quantum reality behaves like a wave of energy, until you measure it, whereupon it behaves like solid particles of matter, with that behaviour understood in terms of probability. On NOVA, The Fabric of the Cosmos: Quantum Leap (16 November 20111) © PBS. Reproduced under Fair Use. Video Source: Youtube. Caption for the above video: "Single quantum particles, such as photons and electrons, can take a superposition state in which they are located in all their possible positions at the same time. But if, at any one of these possible positions, a detector is placed, the quantum particle suddenly takes one fixed position. And this position can be at a location different from that of the detector. Furthermore, these single quantum particles, while in their superposition state, behave as a regular wave, which interacts with itself and with objects it comes into contact with, such as going through two slits and producing an interference pattern as a result. This wave acts as an infinite collection of (quantum) particles which interact with each other, and with other objects, which is how real waves behave. Hence, this (quantum) wave behaves as a physical (real) wave until the instant that any part of it contacts a detector, at which point the location of the quantum particle suddenly takes a fixed position somewhere in the wave space. This phenomenon is commonly referred to as the collapse of the wave function. This wave can also be thought of as a probability wave (in addition to being thought of as a regular wave). The instant the wave encounters a detector, the quantum particle takes on a certain fixed position within the wave space and the probability of taking this particular position is given by the probability density of the wave at this position. The areas of the wave that are larger are the areas that have a larger probability of the quantum particle appearing there. For example, in the double slit experiment involving a single electron fired repeatedly through a double slit, an interference pattern is seen on the screen (which acts as a detector). In this experiment the single electron takes on a superposition (wave) state and passes through the double slit, just as a regular wave would, and creates an interference pattern on the screen as a result, just as a regular wave would. Once this wave reaches the screen the position of the electron suddenly becomes fixed (wave function collapse) and it appears at some point on the screen. After many firings of the electron, an interference pattern appears on the screen corresponding to the shape (and probability density) of the wave. If a detector is placed just behind any of the two slits (and well before the screen), the wave passes through the slits as it normally does but then collapses immediately upon contacting the detector. As a result, the electron position suddenly becomes fixed and its position is at one of the two slits (not necessarily the slit where the detector is placed). The particle then travels in a straight line and impacts the screen. And the impact pattern on the screen corresponds to what we would intuitively expect upon firing a bunch of particles at the two slits -- which is, two lines of impact points appearing behind the two slits. As mentioned, the probability wave contacts (and interacts) with objects just as a regular wave does, but contact with objects does not cause wave function collapse unless the object is a detector. Hence, detectors have a certain property which normal objects don't, which is what's responsible for them causing wave function collapse. What is this property? It's a property related to information acquisition, where you're trying to measure some physical quantity of the quantum particle, such as its position or momentum. But regardless of what's being measured, it's important to keep in mind that only detectors (ie. measuring devices) will collapse the wave function. But normal objects, such as a double slit apparatus, will not." This raises the questions of how and why our consciousness has an impact on reality. Relational quantum mechanics, established in 1994 by physicist Carlo Rovelli, posits that the state of a quantum system is the relationship between an observer and the system. Of course, for millennia, mystics and theologians have believed in spirits, souls, etheric or astral emanations, or celestial entities, which supposedly affect reality. As a result, the question of how mind affects matter has been dismissed, conflated, and simplified as a conflict between science and religion, between believing in rationalistic science with a capital 'S' and believing in God, myths and fairy tales. Because of these contending frameworks of belief and understanding, we risk being unable to consider the problem and to say, in some sense it is neither and both. Hard Talk (3 January 2016) © BBC. Reproduced under Fair Use. Video Source: Youtube. On 3 January 2016 (rebroadcast 28 December 2016), BBC's Stephen Sackur interviewed British neurosurgeon Dr. Henry Marsh to ask him about the human mind and how it works. Marsh asserted that he believes in science with a capital 'S.' While digging around in his patients' brains with scalpels and little vacuums, he assumes that the cerebral grey matter he cuts and suctions forms reason, dreams, memories, and emotions. Higher senses and personality are electrical reactions in the soup of neurochemistry. He asserts that there is no way that the soul could be separate from the organ between our ears. However, Dr. Marsh admitted, despite his intimate understanding of the physical brain, that he does not know how thoughts and consciousness are formed. You can see many interviews with him on Youtube, here. Sackur asked about another reported bridge between the physical and metaphysical: the near death experience. Marsh accounted for the phenomenon scientifically. He did not address relational quantum physics, nor the fact, scientifically confirmed in 2013, that our thoughts change matter at a speed of three trillion metres per second. There are other mysteries around this question. A 2003 film, 21 Grams, drew its title from the assumed weight of the soul. This is the amount of mass lost by a body right after a person dies, roughly 3/4 of an ounce, as measured by Dr. Duncan MacDougall (c. 1866-1920). And biologists and ecologists confirm that animals and insects which do not seem to have consciousness - by our human-centric definition - seem to understand the distinction between life and death in complex ways. What is Consciousness ? - Three Stages of Consciousness | Michio Kaku (3 March 2016). Video Source: Youtube. In short, all of this implies that when we look at something, we transmute energy into matter and we transform something infinitely possible into something fixed and determined in solid form. It is a fascinating and challenging field. At NYU, Dr. David Chalmers, a professor of philosophy, co-directs the Center for Mind, Brain and Consciousness. Chalmers relates consciousness to the philosophy of mind and language, cognitive science, metaphysics and epistemology. All too easily, these ideas enter the fringe, the New Age, the uncertain borderland where scientists confront mystics. Any answers you may find here are a curiosity and mystery. Noetic Science is a fringe field which attempts to relate mind and matter. New Experiments Show Consciousness Affects Matter ~ Dean Radin Ph.D (7 June 2016). Video Source: Youtube. In the video above, Dr. Dean Rabin gave a talk at the Science of Consciousness Conference in Tucson, Arizona, USA in 2016. He claimed, after thousands of experiments, that consciousness collapses the wave function over the Internet. In other words, concentrated observation of previously unobserved matter across the Internet, with an observer focusing through his or her computer at a distant object, will change the observed matter, sitting in real life, at the other end of another computer. Rabin found that distance between the observer and the matter, whether the distance was two metres or several thousand kilometres, was irrelevant. Rabin seemed to hint - and take this skeptically if you will - that the Internet can be used to direct observers' attention on particular matter elsewhere in the world and change that reality at the other end. Again, this seems dubious. However, if the scientific mystery of the double slit experiment concludes that mind does change matter as it appears to do, then the Internet can be used as a big tool to focus the collective of human minds and change matter in different parts of the world. This would mean that the way the Internet channels the human collective consciousness in virtual reality really does transform the real world. That would make the Internet the biggest amplifier of human consciousness - ever. And it would make the nature of virtual content, with all of its emotional, post-truth, neo-political and neo-spiritual rabbit holes of disinformation even more important. Now, consider what it might mean to weaponize information and post-truth ideas in that Matrix. Then consider what it might mean to weaponize the whole Matrix, with us in it. Team links two human brains for question-and-answer experiment (23 September 2015). Video Source: University of Washington/Youtube. Mind-Reading Experiment Sends Thoughts Over the Internet (24 September 2015). Video Source: Youtube. I know it sounds like something that Lex Luthor would invent: the Internet, a collective consciousness amplifier to change real world reality. That possibility may be too 'out there' for some readers. The more sober will consider that other experiments have quantified brain wave communication between different people's brains, using the Internet as an interface. 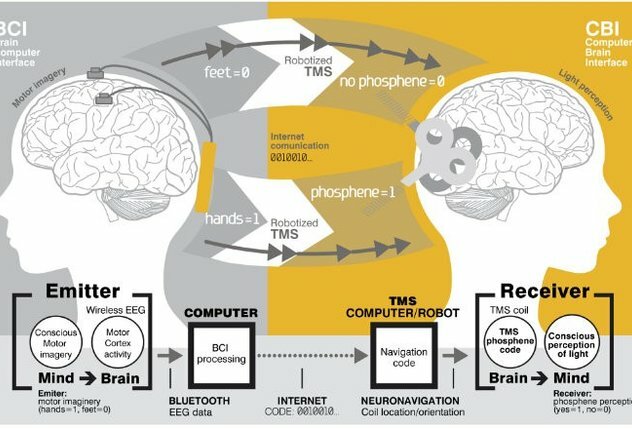 The first experiment on brain-to-brain communication over the Internet was conducted by Dr. Andrea Stocco at the University of Washington in 2013. Other developments in the same field reached the news in 2014 and 2015. Stocco proved that thoughts could be captured as electrical impulses, converted into binary code, and sent across the Internet. She and her team had confirmed that 'online telepathy' certainly exists. Her 2014 scholarly article on the topic is here. This research has enabled big leaps in cybernetics, so that an artificial limb can obey brain commands. Now, does collective online telepathy already work, worldwide, without the wires, at the quantum level? Only the mystics know for sure. Scientist vs Mystic | A Conversation about Cosmos, Brain and Reality | David Eagleman and Sadhguru (16 August 2016). Video Source: Youtube. This blog is a labour of love. If you enjoyed this post, please support my work and donate to keep this blog running!